Cecilio has proven itself to be one of the most trusted brands when it comes to musical instruments, especially for beginner violins. 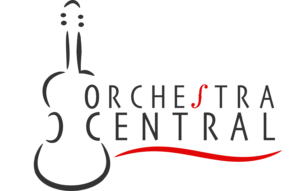 Cecilio stringed instruments, in particular, are hand-crafted instruments that are made skilled luthiers to provide quality instruments at affordable prices. 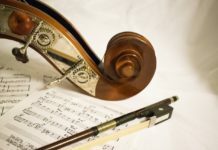 One of the most popular stringed instruments of the brand is its violin. Cecilio violins are known for their sound quality and their physical appearance. In this article, we will take a look at the ten best Cecilio violins on the market so that you can find the perfect Cecilio violin for you. Since picking the best Cecilio violin can be challenging, we hope this guide helps you narrow down your search. When comparing the Cecilio violins, there are a few things you want to watch out for. This way, you are not only ensured of a quality instrument, but you also get to have an excellent violin for your performances. Here are two features that you should look for when selecting the best Cecilio violins. The violin you are going to choose should have a solid construction. There should be no cracks or seams that could be seen. There should also be no creaks heard when you gently apply pressure on the violin. One of the factors that affect the construction is the use of woods. 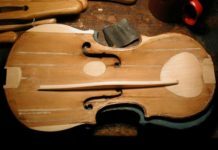 Usually, a quality violin is made with spruce wood for its top and maple wood for its sides and backs. Another type of wood used in the other components of the violin is ebony. It is worth noting that the quality of wood affects the quality of its built. The second thing that you should consider is the violin size. 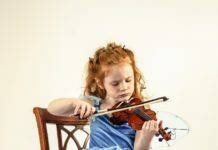 Since it is difficult to play a violin that is too big, consider picking the instrument that fits the size of the player. 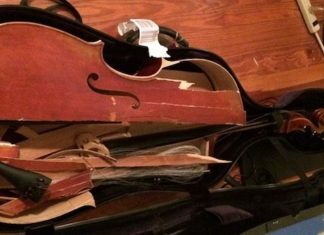 Violins come in nine sizes. Adults generally use standard, full-sized (4/4) violins. For children and teenagers, there are other sizes including 3/4, 1/2, and 1/4. These are just some of the features that should be noted when looking for Cecilio violins. 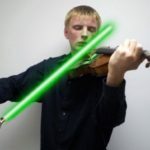 It is worth noting that awareness of the key features will make your job of choosing the most appropriate instrument. The first on the list is the Cecilio CVN-300 Violin. It is equipped with a solid spruce wood top and a maple back, neck and sides. Additionally, it also has a fingerboard, chinrest, tailpiece, and pegs which are made up of ebony. It also has four detachable nickel plated fine tuners. It also has D’Addario Prelude Strings. Aside from the violin itself, the set also comes with a chromatic tuner, a lightweight hard case, two Brazilwood bows with genuine Mongolian horsehair, a quality rosin cake, and an adjustable shoulder rest. The Cecilio CEVN-1BK Electric Violin consists of a hand-carved solid maple wood body. Its fingerboard, pegs, tailpiece, and chin rest are made up of ebony wood. The tailpiece, in particular, consists of a mother of pearl inlay. The violin is varnished in black metallic color. It is powered by a 9V alkaline battery, so you can play it even without plugging it into an outlet. The electric violin also includes a lightweight hard case, a quality rosin cake, a Brazil wood bow with unbleached genuine Mongolian horsehair and a bridge. It also comes with an aux cable and headphones, giving you the option to play it through an amplifier or not. The Cecilio CVN-200 Violin is another quality violin that you could choose. It consists of a solid spruce wood top and maple back, sides, and neck with inlaid purfling in natural varnish. It also consists of a maple wood fingerboard, a set of pegs, chinrest, and tailpiece which are made of boxwood, and four detachable nickel-plated fine tuners. It also has D’Addario Prelude Strings. Aside from the violin itself, the set also comes with a chromatic tuner, a lightweight hard case, two Brazilwood bows with genuine Mongolian horsehair, a quality rosin cake, and an adjustable shoulder rest. The Cecilio CVN-500 Violin consists of a solid spruce wood for its top and maple wood for its back, sides, and neck with inlaid purfling in satin antique varnish. 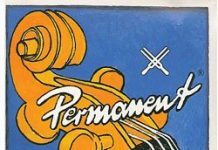 It also consists of an ebony wood fingerboard, pegs, chinrest, and tailpiece, and four detachable nickel-plated fine tuners. It also has D’Addario Prelude Strings. Aside from the violin itself, the set also comes with a chromatic tuner, a lightweight hard case, two Brazilwood bows with genuine Mongolian horsehair, a quality rosin cake, and an adjustable shoulder rest. The Cecilio CVN-EAV+SR Violin is an attractive violin that consists of a hand-carved spruce top and hand-carved solid maple back and sides. It has a beautiful inlaid puffing and an antique finish. The fingerboard, chin rest, and pegs are made up of ebony. The tailpiece of the violin consists of four nickel-plated fine tuners. 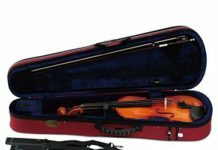 The violin further comes with a deluxe oblong hard case, an adjustable shoulder rest with rubber feet, a Brazil wood bow with unbleached Mongolian horsehair, and bridge, and a quality rosin. The Cecilio CEVN-2BK Electric Violin consists of a hand-carved solid maple wood body. Its fingerboard, pegs, tailpiece, and chin rest are made up of ebony wood. The tailpiece, in particular, consists of a mother of pearl inlay. The violin is varnished in black metallic color. It is powered by a 9V alkaline battery, so you can play it even without plugging it into an outlet. The electric violin also includes a lightweight hard case, a quality rosin cake, a Brazil wood bow with unbleached genuine Mongolian horsehair and a bridge. It also comes with an aux cable and headphones, giving you the option to play it through an amplifier or not. The Cecilio CVNAE-White+SR Violin is an instrument that could work as an acoustic or an electric violin. It consists of a hand-carved solid spruce top and solid maple back and sides with volume and tone control. It also consists of an ebony wood fingerboard, pegs, chinrest, and tailpiece, and four detachable nickel-plated fine tuners. Aside from the violin itself, the set also comes with a Brazilwood bow with unbleached genuine Mongolian horsehair, an adjustable shoulder rest with soft foam padding with soft rubber feet, a lightweight foam fitting hard case, a high-quality rosin, a violin bridge, and an AUX cable. The Cecilio CVN-600 Violin consists of a hand-carved highly flamed maple back and sides and a solid grained spruce top. It also has a beautiful inlaid purfling and hand-rubbed oil finish. Furthermore, the violin is equipped with ebony pegs, chin rest, tailpiece, and fingerboard. The tailpiece, in particular, has four detachable fine tuners. 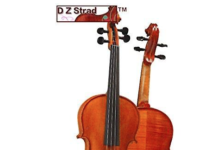 It also is equipped with D’Addario Prelude Strings.The violin comes with an oblong case with a hydrometer, two Brazilwood bows with unbleached genuine Mongolian horsehair, a chromatic tuner, an adjustable shoulder rest, a quality rosin cake, and an extra bridge. The Cecilio CVN-100 Student Violin consists of a solid spruce wood for its top and maple wood for its back, sides, and neck with inlaid purfling in satin antique varnish. It also consists of a maple wood fingerboard, pegs, and a chinrest. It alloy tailpiece comes with four built-in nickel-plated fine tuners. It also has D’Addario Prelude Strings. 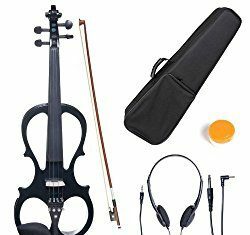 Aside from the violin itself, the set also comes with a chromatic tuner, a lightweight hard case, two Brazilwood bows with genuine Mongolian horsehair, a quality rosin cake, and an adjustable shoulder rest. The Cecilio CVN-700 Professional Violin consists of a hand-carved highly flamed maple back and sides and a solid grained spruce top. It also has a beautiful inlaid purfling and a semi hand-rubbed oil finish. Furthermore, the violin is equipped with ebony pegs, chin rest, tailpiece, and fingerboard. The tailpiece, in particular, has four detachable fine tuners. It also is equipped with D’Addario Prelude Strings.The violin comes with a deluxe hard case, two Brazilwood octagonal bows with unbleached genuine Mongolian horsehair, an extra set of strings, an adjustable shoulder rest, a quality rosin cake, and two extra bridges. Cecilio has been a trusted brand when it comes to violins. The Cecilio violins are equipped with outstanding features, making them a reliable instrument to use. However, their models have slight differences that distinguish them from one another. This is when scrutiny comes in. It is then important that you become aware of the features that are present in the Cecilio violins so that you could identify the most appropriate model based on your preference.